The saying goes something like this, “He who dies with the most toys, WINS!”. For some it’s a Corvette, for others it’s a vintage car, a boat or even an airplane. For me it’s an electric car. No, not one of Elon Musk’s Tesla Model 3’s but a Chevy VOLT “Plug-In Hybrid”. Did I want a Tesla, you bet ya but the idea of waiting 1-1/2 years to get one doesn’t sit well with us older guys. 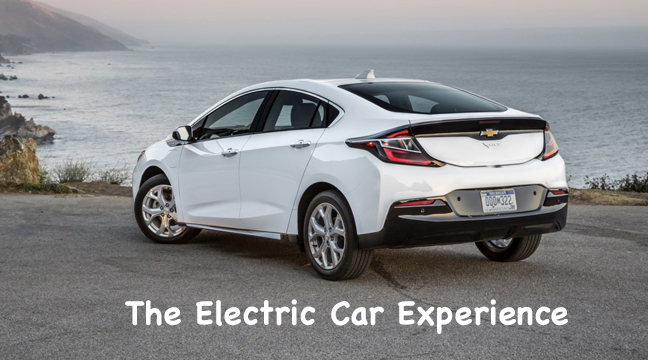 Besides, the Chevy Volt has more than enough tech to satisfy the GEEK in me as I experience living with and driving an electric car. Stay tuned for more about the journey as I go forward…. I’ve always been enamored by new technology and dived in to experience it and, most times, well before our friends and family. I started reading about the “affordable” Tesla that Elon Musk was coming out with and wanted to dive into this relatively new way of getting around. I considered putting in a reservation for a Tesla Model 3 in the hope that “basic” versions would be available when my turn came up. Currently, the wait is 12 to 18 months and there is some uncertainty as to IF the entry level basic $35,000 car would ever be available. My concerns were not limited to the initial cost and wait time. The nearest service center is some 60 miles away and there are no “Super Chargers” in my area. In addition, I’d have to most certainly spend a couple thousand dollars getting a proper charge port installed in my garage. And, BTW, I only have a one car garage so the Tesla could be parked outside in winter to cut down on car jockeying. And then I came across the Chevy VOLT and it’s blend of electric propulsion and “range extender” which removes the “range anxiety” common in all electric cars. I zeroed in on the Chevy VOLT for several other reasons as well with the most prominent of which is it’s available NOW. In addition, there is an entire network of Chevrolet dealer/service centers across the country. We’re retired and most of what we do is within a 50 mile round trip so we’ll be able to utilize electric much of the time. For longer trips, there’s the gas powered “range extender”. There’s a lot of technology built into the VOLT which I’ll totally enjoy figuring out. The technology is changing so fast that I had concerns about buying a new car. All new cars lose about half of their value in the first 3 years. EVs are no exception. Besides new, there were two other options…. 1. Lease the car. You’re still eating the first 3 years of depreciation but have the option of turning the car back in should technology advance to the point the car becomes difficult to sell. Of course, the option to buy the car remains. Fundamentally, I’m not a fan of leasing and have concerns over what constitutes “normal wear and tear”. We’ve heard stories of people getting dinged for all kinds of stuff especially if they are not buying the car or getting another lease. 2. A more reasonable option is to buy a used car that has already had some or all of the initial depreciation covered by someone else. In my case, I wanted a VOLT Generation 2 which meant 2016, 2017, or 2018. Obviously, Gen 2’s haven’t been around long enough to be coming off of 3 year leases so availability on the used market is limited. There were some Gen 2’s out there but nothing close to home. So, what did I end up doing? I was pretty much ready to give the lease option a try when a new listing at a local Volvo dealer popped up on the internet. The listing was for a 2017 Volt “Premiere” with just under 30k miles. According to KBB it was priced about right so we headed off to take a look at it. A look over, a test drive, and we bought it. It should be noted that a comparable 2018 was about $8,000-$10,000 more. Remaining manufacturer warrantees apply. In this case, I’ve got about 6,000 miles on the base warranty. More importantly, the battery and motor carries an 8 year / 100,000 mile warranty. Frankly, I’m pleased about owning a Volt because I don’t have to worry about putting to many miles on it and about lease end “wear and tear” issues.